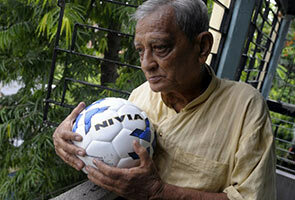 81-year-old Indian football enthusiast Pannalal Chatterjee poses on his balcony with a football. KOLKATA: Their World Cup love affair began more than three decades ago in Spain. Now 81-year-old Pannalal Chatterjee and his wife Chaitali, 72, are once more heading from cricket-mad India to the ultimate football fiesta. "This may be my last one, but I am so happy at getting the chance to watch a tournament in Brazil," Pannalal said during a stopover in Singapore on his way to what will be the couple's ninth World Cup. "It's always been my dream to watch the World Cup in Brazil. It's the Mecca of football," he told AFP by phone. 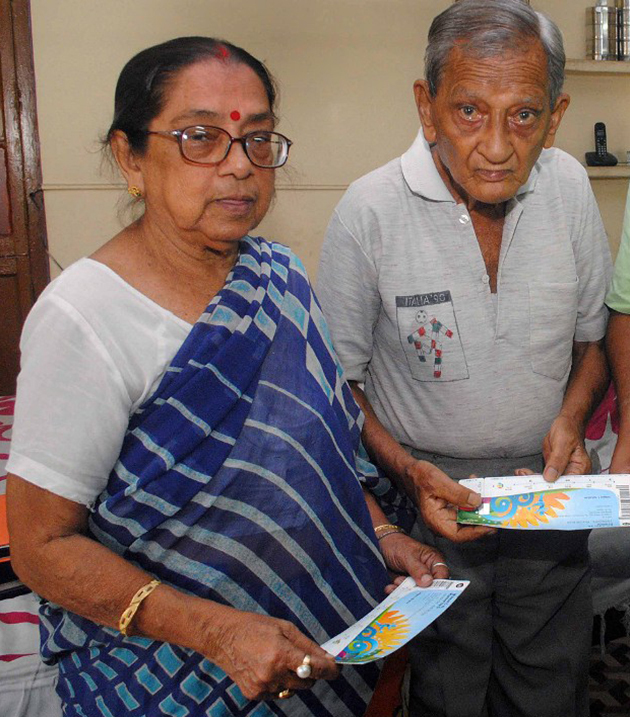 The Chatterjees, who live in the eastern city of Kolkata, are life-long football fans and Pannalal has been involved as a volunteer administrator for the sport in eastern India since the early 1970s. They got their first taste of top-level football in 1982 when a friend whom they were staying with in London got them tickets for the tournament in Spain, when a young Diego Maradona first garnered global attention. "Such was the excitement of the tournament that I was determined from then on not to miss any World Cups in the future," said Pannalal. Four years later, the Chatterjees were in Mexico when Maradona captained Argentina to victory and lifted the Jules Rimet trophy at the Azteca stadium. "The final between Argentina and West Germany was unforgettable. The Argentinians won 3-2 and there was so much excitement," he said. While Maradona remains the ultimate hero of Chaitali, her husband is a staunch fan of Brazil and speaks proudly of the time Pele agreed to pose with them for a photo. The couple, who have no children and live off Pannalal's monthly pension of 7,500 rupees ($125) from his time as a shipping clerk, scrimp and save all year round to be able to afford their trips every four years. "For the last four years, I have been holding back from eating my favourite fish and many days my stomach has been half-empty to make sure that we have enough money for this tournament in Brazil," he said. Chaitali also manages to make a bit of money by making sarees and the couple have a special World Cup fund which they top whenever they can can. In order to make ends meet in Brazil, the couple have taken some of their own food, including packs of potato chips and packets of tea. Impressed by their dedication, FIFA is providing them free accommodation in Brazil while a local television company is helping them with the tickets. In all the years that the couple have been going to the finals, the Indian team has never even gotten close to qualification -- not that the couple have allowed that to dampen their enthusiasm. Pannalal describes his love of the game as akin to an "addiction" while his wife is able to reel the dates, venues and stars of all the tournaments.